I am going to do a string of homeschool posts...since I have a backlog of pictures and ideas! My girls have been watching me sew since the time they were babies. Both beg to learn. For homeschooling we just finished reading The Boxcar Children. The book was charming and engaging for both Ellery and Callista. I love the old fashioned values of hardwork, honesty, and self-reliance the children exhibit. 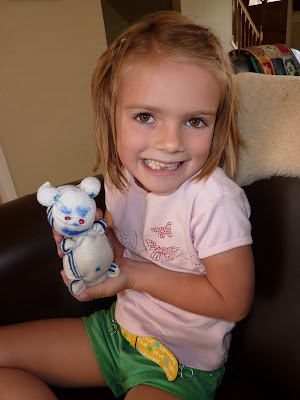 At one point Jesse and Violet, the two sisters in the book, make a "stocking" teddy bear for their little brother Benny. Certainly they ended up covered in jeweled stickers and with sparkly earrings...what real teddy bear isn't? A perfect opportunity presented itself for giving the girls their first sewing lessons. 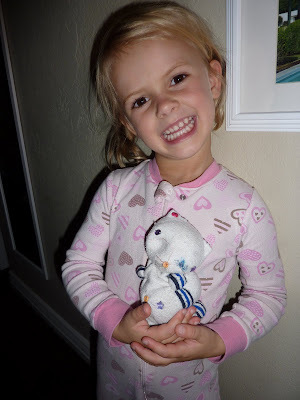 After rummaging through Daddy's sock drawer, and procuring the perfect rainbow assortment of threads and buttons the girls stuffed the socks with rice and made these darling little teddy bears. It was great hand-eye coordination training and more importantly they loved it and built self-confidence in the process. 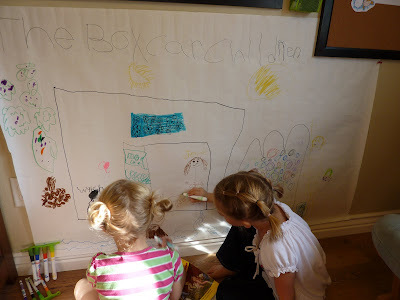 To conclude our unit on The Boxcar Children, the girls made this great mural. We went through the book and remembered all the wonderful things the children were surrounded by in their little boxcar home. I hadn't read this when I talked to you today. I LOVED the Boxcar Children books when I was younger and was just thinking about them the other day. I need to start reading "chapter books" with Bryan. And both of your little projects are so cute! What lucky girls. That is so cute! I don't remember the books, I will have to read that with Zane when he is older. Hmm..you always have such great things you do! Thanks for the ideas!